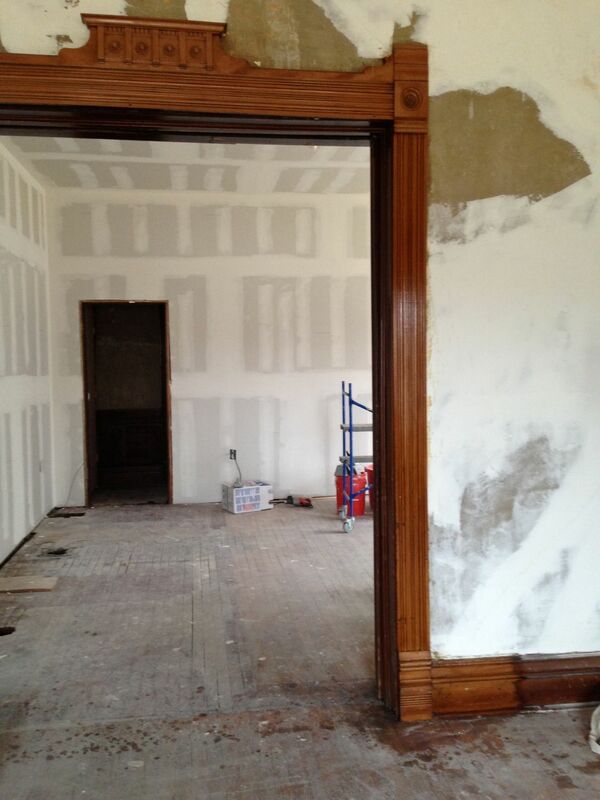 Almost a year ago I did a post about refinishing the trim in the parlor. The flooring to the left is where two pink bathrooms were built in 1950. You can see the holes where the toilet plumbing was, and tub drains. The flooring in this area was pretty punky, and the flooring on the other side of the room was termite-damaged. The same view, today. The library floor was replaced with custom-milled oak to match all the other flooring in the house. Boards in good shape were salvaged, and will be used to patch rooms in the rest of the house. The library and parlor floors need to be sanded, stained, and varnished. Maybe in 2016? Please? Pretty please? The shelving still needs its base installed, and the door to the hall needs its upper trim. 11 Responses to A Year Later. Love all the bookcases and a great job on the floors. Sometimes I fear my library will not hold all my books and I will need to downsize. This library looks spacious enough to hold endless amounts of entertainment on those vast and chilly days of winter. Your books are home – Congratulations! Everything is starting to take on new life and looking good. And that walls of BOOKS are once again gracing the library (how many decades since this has been true?) THRILLS me. 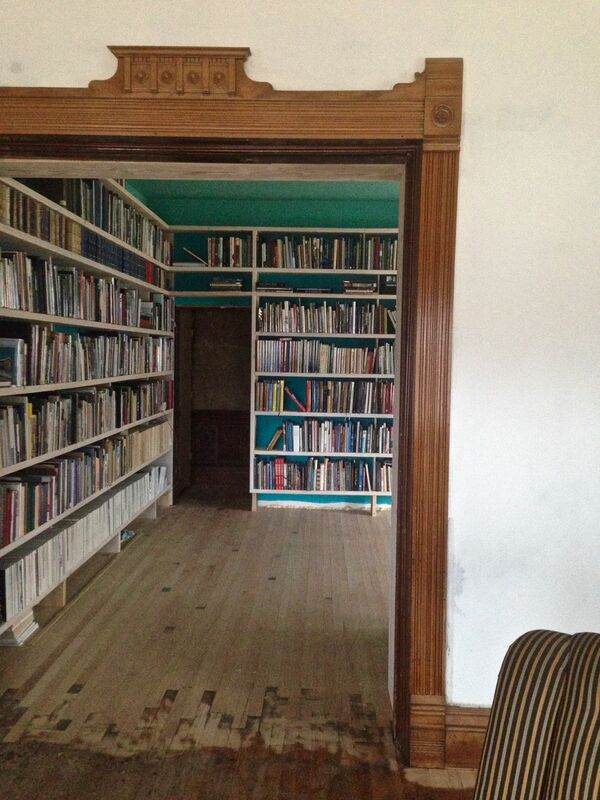 How about putting bookshelves on the “door to the hall” and making it a hidden secret door? The room turned out beautifully, and the shelves are lovely. They look like the float against the walls. You and your books must be so pleased that they have a new home. White shelves? I can get used to that garish paint but plain white shelves in a house with all that ornate woodwork. I’m not sure you understand libraries after all. If so, my library is full of books! The shelves are white for a reason, and this will be made clear when I reveal the room in a later post! And the paint color looks great with the original trim, mantel, and stained-glass. That is why I picked it! You may not have heard of the Comedian Marshall Dodge. He and a guy named Bob Bryan (both of whom were from Mass.) specialized in revitalizing Maine dialectic humor about 30 years ago. They did the “You can’t get there from here” skit. They also did one about a privy builder that every time he’d get building Mr Perkins privy, Mr Perkins would come out with a new change and the privy builders reply was always – well, Mr Perkins, it’s your privy. So, I guess my reply would be – Well Mr Ross, it’s your library. BTW -the final line in the privy skit is when Mr Perkins comes out and wants it changed to a 2 holer and the privy builder objects saying, Well, Mr Perkins, some night you’ll come out here and you’ll be say pressed for time and by the time you’ve made up your mind, it’ll be too late. White shelves no matter how good they look are a little too IKEA for me but if they work for you then they work. Many years ago I bought two Eastlake bookcases in walnut that were built into a Victorian house in Portland Maine unfortunately two of a set of 14 that ran all around the walls of the house. Like most Eastlake they are ornate and I guess that’s what I think of as the gold standard of library shelving. I had my books in boxes for many years. I don’t think my children even really saw them. They are out now but the shelves are full.